Boeing 777-9 Takes Shape in Assembly Line. 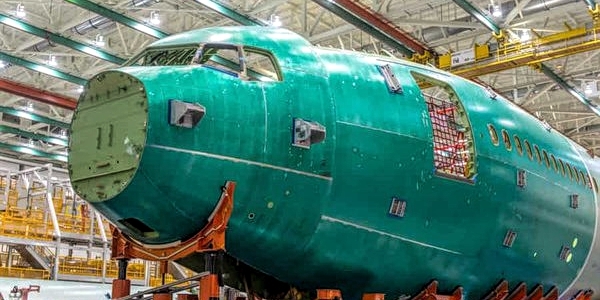 The main sections of the fuselage of the first 777X aircraft have entered the Boeing Fuselage Assembly Center in Everett, Washington, says Boeing. In a tweet photo of March 23, Boeing showed the first Section 41, the company's internal designation for nose and front fuselage, entered bay 40-27 of the Everett factory. The first 777-9 version of the 777X family to enter the fuselage assembly will be used for static ground tests, says Boeing. Within bay 40-27, Section 41 will join the center and the rear fuselage sections, using a new process introduced two years ago in the 777-300ER and 777-200LR programs. Instead of loading the assemblies into a rotating tool attachment, Boeing will dock the 777X using the automated fuselage update process (FAUB), in which the sections are loaded onto movable cradles and joined using primarily drilling and clamping robots. Later this year, the assembled fuselage will move to the final assembly compartment for the 777X, where it will join with the aircraft's first new composite wings. Boeing introduced the first wingspar 777-9 in assembly last year for the static test aircraft. Now, the wings for the first flight test plane are also moving through the assembly process in the new and cavernous compound wing center inaugurated last year in Everett to support the 777X program, says Boeing. During the final assembly, Boeing also combines the fuselage with the wings, the on-board systems and the GE Aviation GE9X engines. GE launched the flight tests of the GE9X in mid-March on a flight test bench 747-400 owned by the company. The 777-9 program is scheduled to enter flight tests in 2019 and enter service with the launch operator Emirates in 2020. The 777-8 with the largest reach will enter service two years later.